Our friends Randy and Angelique were visiting from the Atlanta area last week and we had a great dinner at Dan Silverman’s the Standard Grill at the base of André Balazs’High Line hoverer, the Standard Hotel. Last time they visited a few years back, we dined amongst Martha Stewart and Lucy Liu at Buddakan, so the bar was set pretty high. Unfortunately/fortunately, since Big Bub was born, my douche threshold is at an all-time low, which means earlier, lower-key dinners and avoiding any place that’ll erupt into a nightclub during the first course (my, my how times have changed). Glamadad and I had lunch at the Standard when it first opened last year and put it at the top of our list of places to return to for dinner but never made it back. We also loved Silverman&apos;s now defunct Lever House. The hype has died down a bit but the food is as solid as I remember. 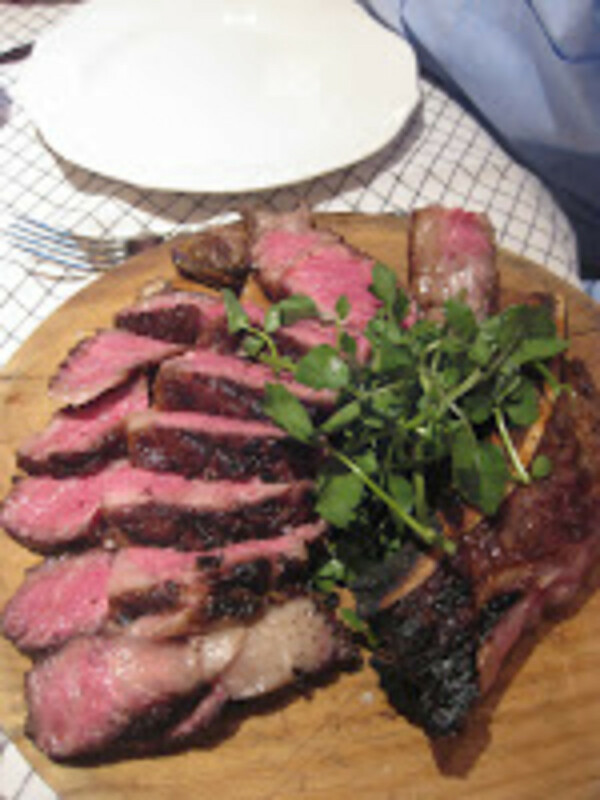 If you like a bistro scene, à la Keith McNally, I think you&apos;ll like the Standard Grill too. We sat in the back dining room but the bar area is just as inviting, if not a little more energetic and conducive to people watching (it is after all, the Meatpacking District). I highly recommend starting with some of the house cocktails. 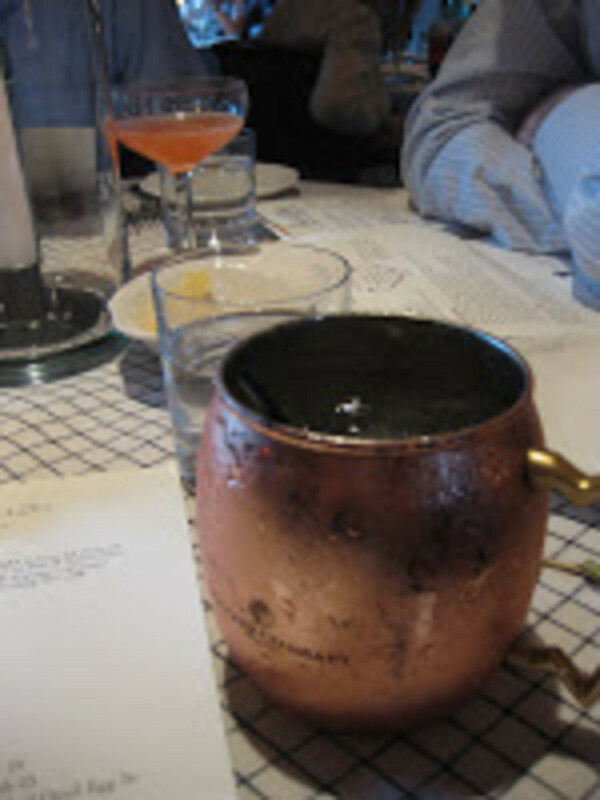 I had the Penny Drop (vodka, lime juice, ginger beer, fresh ginger, and a house-made ginger cordial) served in a copper cup (consistent with the copper penny theme, the floor of the dining room is tiled with thousands of copper pennies). The drink is delicious but so much ginger left me craving sushi. The Near Side was also popular (vodka, lemon juice, Campari, grapefruit, and Champagne) and served in an old school champagne glass. 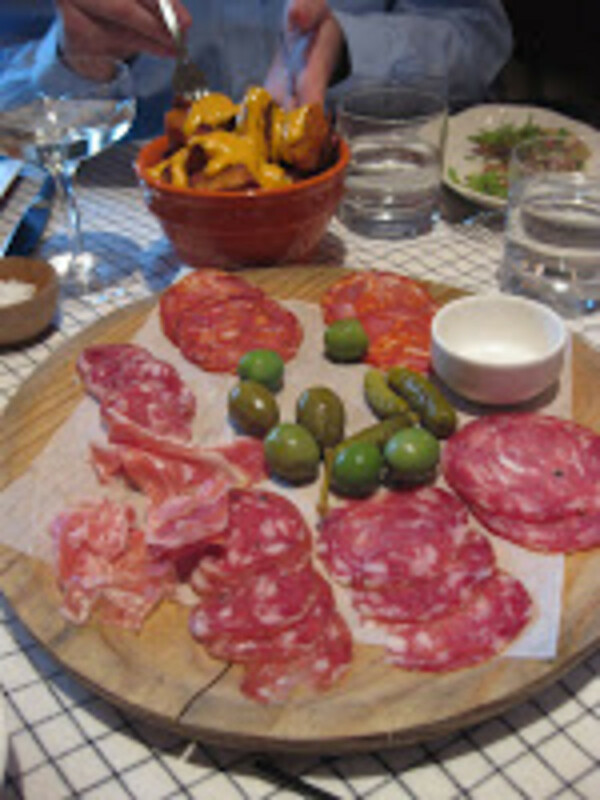 For appetizers, we had the recommended steak tartare a Go-Go, charred Spanish octopus, the full array of antipasto-style meats from the Counter, and crispy potatoes drizzled with smoked, spicy paprika aioli. We were thrilled with everything but the octopus was the standout. Also, the salty, pretzel-like bread that accompanies the meats is to die for, thus the first course turned out to be a meal unto itself. I was making little sandwiches with the meats and filled up rather quickly. That didn’t stop us from going big on the mains though. After all the antipasto, I naturally wanted pasta so I ordered the ricotta cavatelli with braised artichokes, asparagus, peas, and Parmesan. Salty sweet and seasonal but not the wisest bistro choice although it was decent and lighter than it sounds. Randy and Glamadad split the Pat LaFrieda “Demi-Vache” dry-aged rib eye steak for two, which was a big hit, and Angelique had the flash seared lamb chops with polenta and basil, which also got a thumbs up. ***Skip the alluring beer garden. Sure it’s outdoors and crowded with seemingly stein happy folks but the reality of this douche depot hits you right in the nose once you get past the ticket line (yep, you have to buy tickets first, then wait in line again to exchange them for a drink). The joint smells like a puked out frat house (didn’t I go out to get away from that smell for a few blessed hours?) and up close those ticket holding jerk-offs look like they’re waiting for an f-ing raffle to begin. Walk over to Fig & Olive and have a pomegranate martini instead. And don&apos;t forget a walk on the High Line!